Sing the title of this post to “Run it” by Chris Brown while watching this gif and tell me you didn’t smile. I wrote this before I realized someone else also wrote about running as their hobby…. hopefully our posts are different enough to not be redundant. Me after my first 5k! Running is not something I ever thought I would enjoy. Even after I started running for fitness, I did it infrequently. I would push myself too hard, injure myself, and have to back off before I could do anything else. Last year, I decided I wanted to participate in a color run (specifically Color Me Rad). I learned how to pace myself and trained like crazy. I discovered it was something I enjoyed… a lot! I even decided I would sign up for the running class here at UA (who doesn’t want class credit for doing something they love?). Anyway, here is my experience with running using Tinbergen’s four “Why” questions. Historical: Legends of the first marathon come from Greece in the 5th century BCE. 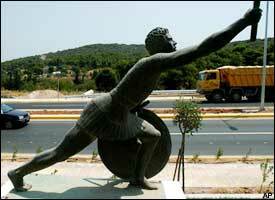 After the Athenians defeated the Persians at Marathon, Pheidippides was tasked with delivering the news to Athens. He ran approximately 26 miles (the length of a modern marathon) to deliver the news, and subsequently collapsed and died from exhaustion. Competitive marathon races were started in the modern Olympic Games in 1896 to honor this part Greek history. Let’s rewind a little bit before moving on. In the 16th century, jogging was a common part of training for swordsmen. In the 19th century, running was part of the training regimen of many athletic sports. The modern running fad was started when Bill Bowerman published Jogging in 1966. Recreational running was born from these events. Proximal: Why did I start running? I actually hated running for P.E. or really for any other reason when I was younger. My mom used to say “I will only run if I’m being chased” and I adopted the same philosophy. I knew people who played sports and even some who ran for fun, but it never interested me. In fact, I actively avoided it. Developmental: Thinking back on it, I became interested in health at the peak of my adolescence. I was already concerned about how I was viewed by my peers. All teenagers are. However, the concept of “dieting” wasn’t really introduced to me until high school, when some of my friends joined the dance team and were required to maintain their weight (something about extreme weight gain/loss throws off your center of gravity, resulting in bad form, injuries, etc…) which I thought was horrifying at the time. With the color guard my junior year before a parade! But, of course, I wanted to fit in, so I joined in. I was also a member of the color guard throughout high school, and if you’ve ever tried to toss a flag into the air you know it takes some strength! I found that I really enjoyed learning about nutrition and health and why our bodies work the way they do.